Landrum has the most vibrant downtown of any Spartanburg County community. Rutherford Street is anchored by several good restaurants, retail activity is steady, and pedestrian traffic thrives. Downtown Landrum has even become a destination for residents of Polk County, North Carolina. I've always believed that downtown Inman has the most potential of any Spartanburg County town. Most of it's early 20th century buildings still survive and exude some charm, the railroad track paralleling Main Street adds some uniqueness (rail service to downtown Spartanburg someday? ), and household income in the general area is relatively strong. I've never felt, however, that Inman residents really appreciate what they have. Once that happens downtown Inman will blossom. Boiling Springs really doesn't have a downtown. I don't expect efforts to creat a downtown will occur until the town incorporates. Chesnee's downtown has some old buildings but the town's isolation and low incomes could affect it's ability to develop a charming downtown. Downtown Woodruff has made good strides too. Cowpens was hit hard by a Tornado in the early 70's. Many old downtown buildings were destroyed. That said, the town's leaders have done a nice job with what's there. Highway 110 leading from I-85 to downtown Cowpens is a mess with dilapidated mobile homes and used car lots. Lyman too was hit hard by a Tornado in the 70's but there's a lot of growth in the area that could spur a revival of it's downtown. This may surprise some people but I'd keep an eye on Campobello. Downtown is small but has a handful of old buildings awaiting rebirth. There's something about this small town that feels right. I'm curious what others have to say regarding this topic. I would add Chesnee and Cowpens to that list. They each have small, but relatively intact downtowns. Cowpens has the historic name going for it, they just need to leverage some more funds somehow to spruce up the place. I don't have much to say for Chesnee except that it is on Highway 11. IMO, places on the "Scenic Byway" should have the potential to draw in some of that tourist traffic. I could see Campobello going either way. Their location on Highway 11 gives them some clout, as does being located near Landrum/Saluda/Tryon. If they wanted, they could easily push to include themselves in that string. I think the towns in Western Spartanburg County are a lost cause. They are caught up in the Greenville-Spartanburg sprawl zone, and there's relatively little hope since they are all pro-annexation and pro-development. From what I know about them, the towns don't even like working with each other, so in my mind if they can't work together to improve their situation, how can we expect them to improve themselves? Lyman has that cool old mill though, and some semblance of a downtown. The other one is Woodruff. I think they have a great downtown with a lot of potential. They need to get their economic situation worked out down there, but it has LOADS of potential. Landrum also has a beautiful, new (couple years old) library about a mile from downtown. I think Landrum benefits from its proximity to Tryon, Lake Lanier, and FENCE (Foothills Equestrian Nature Center). Equestrians tend to be pretty affluent. Inman town limits are very small and cover only one side of Asheville Highway. My understanding is that Inman Mills (the other side of the street) is a separate entity established before the mills were built in 1901 or thereabouts, with the proviso that they could not be annexed for 99 years, for tax purposes. However, since the mills are now closed and the 99 years are up, I don't know why Inman hasn't annexed them (to the best of my knowledge). I think a similar situation exists in Pacolet. In my view Pacolet, Central Pacolet, and Pacolet Mills should all be combined into a single municipality. You might be interested to know that Pacolet and Pacolet Mills are already combined. When they combined, Central Pacolet opted out of the consolidation. I've heard that they may be forced to combine due to their severe budget issues. If/when this happens there will be one Pacolet. Pacolet in general has a lot of potential to create a new downtown on S. Pine Street (Hwy9) in the area formerly known as Pacolet Station. I've heard rumors that developers are interested in doing something on that street, but they can't because there is no sewer service there. And waay back when the Mills were still running there was the town of Pacolet Park, where all the mill management lived, and where most/all of the large attractive homes were. They have since been torn down and all that remains is an unincorportated "Victor Park" which is unfortunately beyond the control of the town. If Pacolet could annex Victor Park and the mill site, they would have some serious potential to develop something of a tourist economy with the river and the industrial infrastructure in that area. Their Mayor, I think her name is Elaine Harris, is a real go-getter. She sees the big picture. She's working on lots of good 'stuff' down there and sees the town becoming a bedroom community for Spartanburg. Pacolet, unfortunately, suffers from the Union County economy syndrome in that there is none. The fact that the Pacolet River rolls right through town gives them something to build on. If any of you have ever been through Hot Springs, NC its the same scenario where the town has built itself around 2 rivers (French Broad & Laurel River). I really didn't mean to exclude Pacolet - to all my friends in Pacolet please accept my apologies. You're right Spartan, the mayor down there in Pacolet is a real visionary. She's done a lot for that community. Pacolet has some attributes it can leverage and there's no reason it's downtown can't prosper. Lyman, Duncan, Startex, and Wellford should (but won't) combine into one city. It would make so much sense. Put 'em all together and you might have 4,000 people. I would have to say that Landrum's downtown is fantastic. They have done a great job there and I think they have set an example for Inman to follow. If Campobello and Inman joined the "String of Pearls" I think good potential exists for a seasonal rail excursion to form from Spartanburg to Asheville someday. Lyman, Duncan, Startex and Welford have lost a great opportunity by not combining and making themselves one City. I don't look for them to grow and prosper as downtowns. They may become larger by annexing existing areas, but the look will not change. Cowpens has good potential, but It has no real draw other than its History. It seems some significant news is coming from Pacolet tomorrow. Mayor Elaine Harris said in an email that the announcement "involves recreational and environmental innovation in the Pacolet River/Lawson Fork Creek basin as well as economic development news." This is pretty cool. Pacolet and Glendale have been awarded a grant for $60,000 to fund a feasibility study to look at "developing a corridor to connect the two towns." I read that to mean they are going to study building a greenway system between the towns and probably a more well-defined "blueway" for kayaks and canoes. The total distance is about 8 miles. There's a lot of potential there, and having hiked a lot of the land along the Lawson's Fork and Pacolet River I can say that it is truly an asset to have such natural beauty so close to home. To make it more accessible to the general public would be a great thing for Spartanburg County. The trail would connect some of the longest continually settled land in the Upstate, from the Indians that used to live along the rivers near the confluence to the settlements near the old ironworks that later became Bivingsville/Glendale and of course, Pacolet the largest mill village of its day. Hiking along the Pacolet River is a pretty cool. There are a lot of colorful birds and ducks floating as well as fish jumping. i have always wanted to paddle from where the Pacolet goes under 85 down to Pacolet but just never have done it. Below is link for the hikes. Here's a interesting development out of Duncan- they are getting a pretty large upscale restaurant and lounge, which is incidentally going to be called "Upscale Restaurant & Lounge." The article says its going to be the largest of its kind between DC and Atlanta and will offer a variety of entertainment and food. I'm personally not sure the location will work. My guess is that they wanted to locate between Greenville and Spartanburg, but it seems like they would have been better off locating IN Greenville or Spartanburg. There was a good article about Pacolet developments in the paper today. There are a few interesting things late in the article that I didn't know about. The town has secured $802,000 for the "Pacolet River Gateway Project." Phase 1 will be a lighted, boardwalk-style riverfront park, which is currently in the design phase (no construction date set). Phase 2 will be intersection and infrastructure improvements. Sounds exciting! Can't wait for further info on these developments! 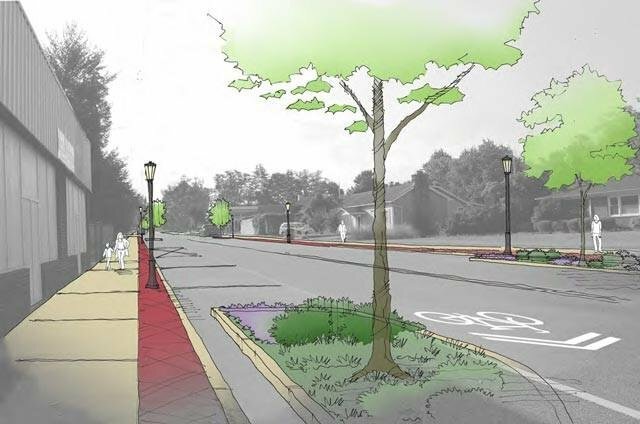 The town of Duncan is moving forward with their Downtown Master Plan, which includes pedestrian-focused streetscaping improvements, powerline relocation/burial, and pocket parks. This will be great, and hopefully make the downtown more of a draw (business & people wise) for the quickly growing area. Edit: Here's the full Master Plan (PDF).